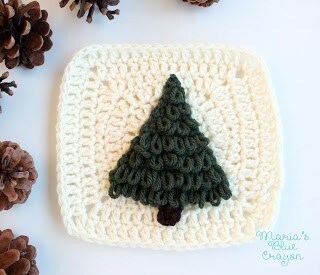 GET THE CROCHET TREE APPLIQUE ALONG WITH THE GRANNY SQUARE IN AN AD-FREE PDF DOWNLOAD HERE. OR SCROLL DOWN FOR THE FREE CROCHET PATTERN AND VIDEO TUTORIAL. The second granny square to my Woodland Afghan is here – a cute little tree! I decided to incorporate the woodland environment along with the little critters. Before starting this afghan, I searched on Pinterest to see what was out there pertaining to woodland theme. (There’s boat loads of woodland themed stuff out there, by the way!) I saw a lot of incorporation of the woodland environment such as pine cones, branches, mountains, etc. I knew I wanted to make that a part of this blanket too, so it will be loud and clear that this blanket says WOODLAND THEME! I redid this tree a few times. Since it’s such a simple design, I didn’t want it to fall flat. I thought back to all the stitches I learned and remembered the loop stitch I learned while making cabbage patch doll hats. This was the perfect stitch to give this tree some texture and stand out! PIN IN TO YOUR CROCHET BOARDS ON PINTEREST. For directions on how to construct the granny square, the colors I will be using, and the running list of squares I have created for this afghan series – click here. I just had to say thank you so much for these adorables squares. I have a 6 year old grandson, who just adores animals. He will get such a kick out of these. I also have your aquatic one. So inspired. Again thank you for sharing your wonderful talent. I knkow one little boy who will be over the moon at Christmas.